Need a no-bake dessert recipe that comes together in just minutes? 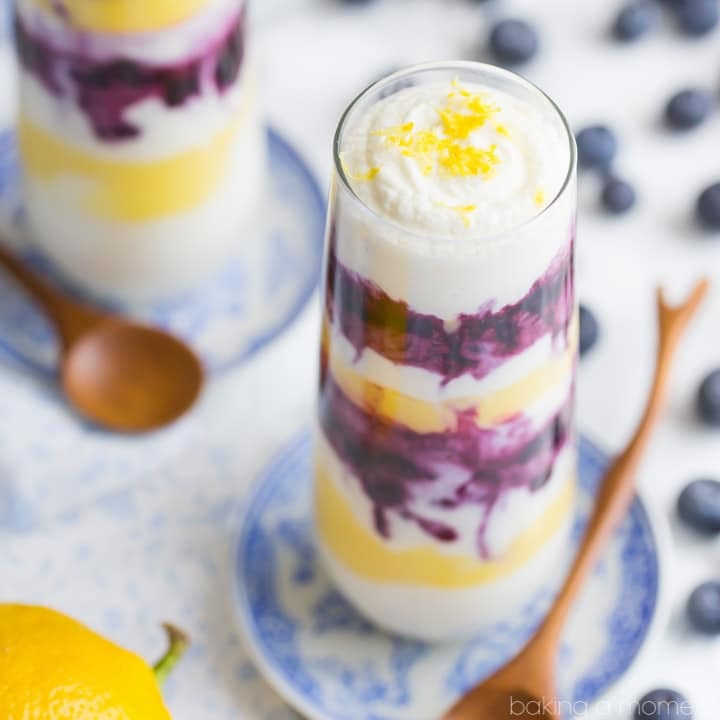 Look no further than these summer-y, seasonal Lemon Blueberry Parfaits! They whip up in a snap and are naturally gluten-free. Hey guys! How was your holiday weekend? Did you have nice weather? Did you have a cookout? Did you have lots of people over, or did you keep it low-key? We didn’t end up having anyone over, which sounds pretty low-key, but really we were pretty busy. We held a yard sale, and my husband mulched all the flower beds, and we put together a fun backyard setup for the kiddos. If you have a swingset in your backyard, you’ve gotta try this: put a little blowup baby pool at the bottom of the slide, and set up a sprinkler behind that. Make it so the sprinkler sprays the slide. It’s like a ghetto waterslide and my kids went nuts over it! We got the idea from my neighbor. So smart! With all the fun and activity I really wanted to whip up an easy, effortless dessert recipe and this totally fits the bill! 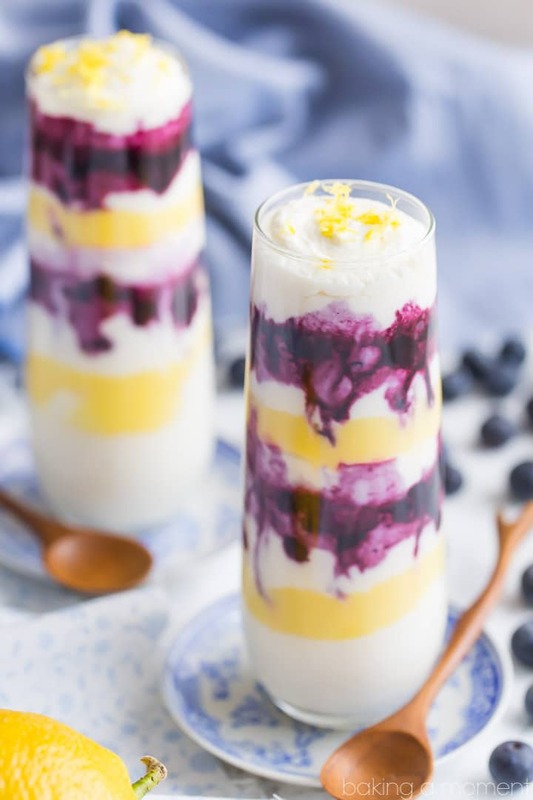 Who doesn’t love blueberry and lemon together? It’s like these flavors were made for each other. Swirl it all together with a little honey-sweetened whipped cream and you have a light, refreshing, seasonal dessert that’s perfect for warm summer nights. No-bake, baby! You can use frozen or fresh blueberries for this. Just be sure to simmer them down to a thick syrup. You want to reduce it by about half. And once that is completely cool, layer it in jars or glasses with the soft whipped cream, and a few dollops of lemon curd. You can check out my favorite lemon curd recipe here. I’ve made it dozens of times and I still can’t get over what a flavor bomb it is and how simple it is to make. I picked up these tall, stemless champagne flutes at World Market, but you could also use little mason jars. Totally cute and totally easy! Sometimes the simplest things really are the best. Especially in summertime when there are sprinkler slides that need attention! Stir the blueberries, water, and sugar together in a small pot. Cook over medium-low heat until thick, syrup-y and reduced by half (5-10 minutes). Cool completely. Place the cream and honey in a large mixing bowl and whip on high speed until the cream holds soft peaks. 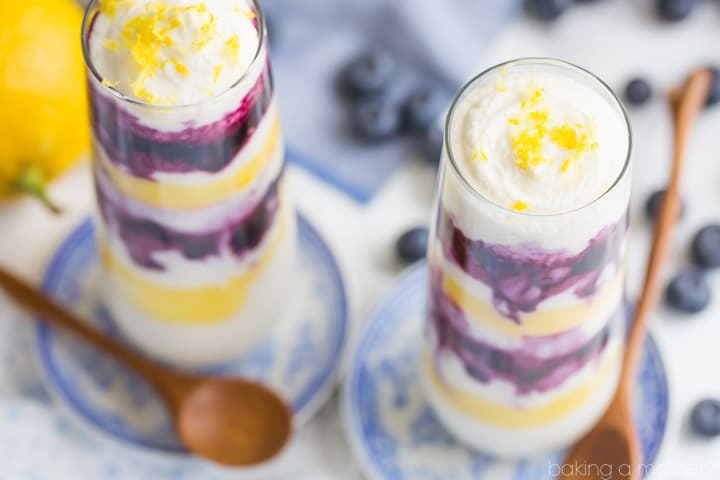 Alternate layers of whipped cream, blueberries, and lemon curd in serving glasses. Allie, the blowup baby pool/water slide idea is great!!! totally going to try that! 🙂 and these parfaits are beautiful! did you pipe in each layer? asking because the glass is to tall. Looks amazing! I just used a spoon, Alice! A little got on the sides of the glass but I just wiped with a clean cloth after each layer went in. Hope you had a great weekend, dear! These parfaits are so pretty!! I’m loving blueberries at the moment so this is the perfect dessert for me! Oh, yay! Blueberries are so fun at this time of year. I’m so happy you like these, Jen! That is one beautiful dessert! Blueberries and lemon are perfect together….and we are totally setting up the ghetto waterslide this week. Sounds like so much fun! Lol right??? My kids absolutely loved it. I bet yours would too! Thanks so much Kellie! 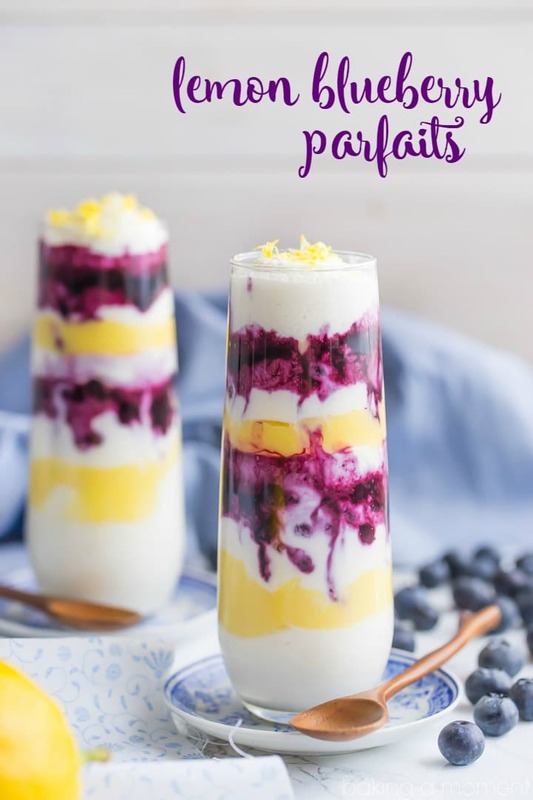 These parfaits look gorgeous! Love that lemon/blueberry combo during the late springtime! Isn’t it so good? Thank you so much Medha and I hope you’re enjoying the start of summer! The combination of blueberry and lemon is always such a classic that I can’t get enough of. Lol, my kids would love your water slide idea!! Totally going to have to try that! Love this dessert and love how simple it is!! Right? I whipped it up in a big hurry- I wanted to be part of the waterslide fun! Thanks so much Malinda! This looks awesome,can I store them in the fridge? Absolutely! That’s a great way to do it. Hope you enjoy! I’m so glad you like it Sophia! I think you should be just fine to do it that way. Good luck and I hope you enjoy! My birthday is coming soon (August 25) and I may have a few friends over for dinner, and I wanted to add for desert your Lemon blueberry Parfaits. Parfaits looks so good. I hope it’s not to late for blueberries. Happy birthday Yvonne! I think your timing is perfect- the blueberries are still doing great here in the Northeast, and the prices are low too. Hope you enjoy! Can you make these a day ahead of time? Hey Gail! I think one day would probably be ok but I wouldn’t push it much more than that because your whipped cream might start to weep or deflate. I hope that’s helpful! Thanks for reading! Thanks so much for the quick reply! How many ounces were the parfait glasses? I have four ounce mini parfait glasses, but I think they might be too small for this recipe. Help! Hey Lisa! There’s a link to the champagne flutes I used within the post. Here it is again, in case you missed it: https://www.worldmarket.com/product/stemless-champagne-flute-set-of-4.do?&from=fn.